You’re ready to hit your favorite trekking route in the mountain next weekend, and you want to spend quality time in nature. You even plan to sleep under the stars this time. But the difference between a nice sleep outside, and an awful night staying awake between two rocks is having a good camping pillow. Of course, there is much more than that but the pillow is a key factor in having a good experience. TETON Sports ComfortLite – Third Place! Klymit Luxe Pillow – Most comfortable camping pillow! Therm-a-Rest Compressible – Best affordable camping pillow! Sleeping outside on the mountain could be a very enjoyable, and relaxing thing and you should not spoil it with being underprepared. I can tell you from my own experience that having a good, quality sleeping bag, sleeping pad, and nice camping pillow can change totally the feel and the quality of your sleep under the stars. That’s the reason I decided to test and review some of the most popular camping pillows on the market these days. I just want to make your decision much easier so you don’t waste time researching. I will give points for each of the pillows for the following categories: comfort, weight, and size. Each fo the camping pillows will get an average final score and this way I will tell you which one is the best for your needs. 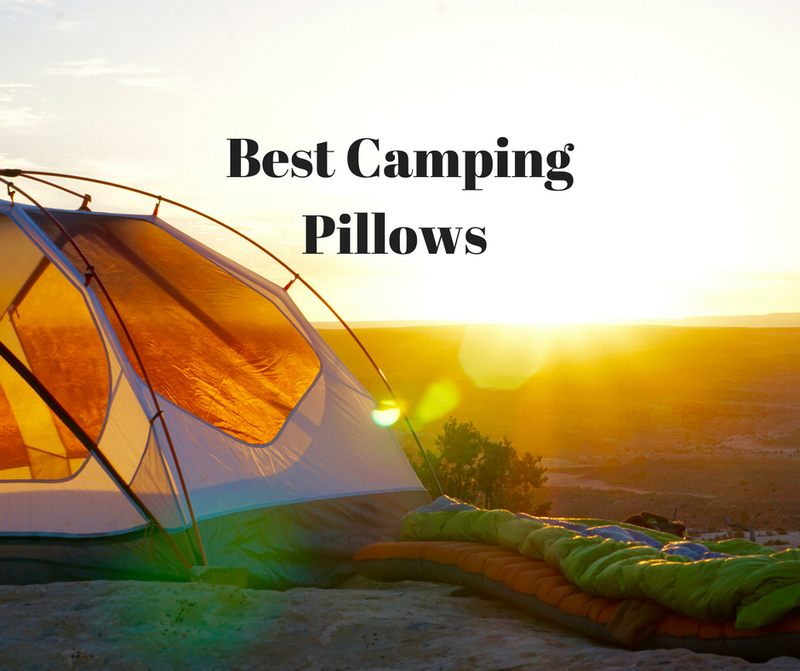 Before starting with the reviews itself, let me explain the three most common camping pillow types and the pros and cons of each of them. The first type which actually is the most common these days is the inflatable camping pillow. Inflatable camping pillows are very convenient. They are made by some kind of foam which expands when you want it. The biggest advantage is that they are small in size and don’t take much space. Also, they can be very lightweight and good for backpackers and trekkers. As we know the weight of every unit we carry on our hiking is very important and we should limit that as much as possible. If you’ll use your camping pillow in your car or RV, the weight won’t be so important. But they have one big downside – comfort is not on par as on the hybrid and the compressible pillows. Also, you have to inflate them with your breath which is not very nice too, especially if you are at high altitudes. Such inflatable pillows can accumulate moisture and bacterias inside which can be dangerous on a long-term. The compressible camping pillows is a different thing. They are usually filled with down feathers, different types of foam, and synthetic fiber. Or in many cases a combination of them. Compressible camping pillows are very soft and they are the closest to normal pillow possible. Compressible camping pillows are very easy to use – you just have to take them out of the bag. But they have one big downside – they are heavier and take much more space in your backpack than an inflatable camping pillow. Also, it seems that compressible pillows cost more than the others. Generally speaking, they are good for car camping, one-day adventures, etc. Hybrid camping pillows are as the name implies – a hybrid between an inflatable and compressible pillow. They usually have a compressible top layer and inflatable bottom side for more support and less packed volume. I personally like very much most of the hybrid pillows because they make a good compromise between size, weight, and comfort. So without further ado, let’s start with the reviews of the best camping pillows for 2018. Sea To Summit Aeros is our top pick for the best camping pillow for 2018. And there are a lot of reasons for this decision. First of all this inflatable pillow is super comfortable and gives a unique sleeping experience. I simply love it! It’s super small to carry ( takes 0.4L of space ) and weight just 2.8 ounces which will not add much to your load. Some users say that they don’t find it comfortable enough but in my experience, Sea To Summit is a top choice. The pillow is made of high-strength thermoplastic polyurethane bladder and a very nice synthetic fill between the bladder and the case. Also, the pillow itself is curved so it creates a comfortable cradle for your head. It’s available in two colors – green, and blue. I personally like the blue one. The price is normally between $35-50 on Amazon, and I should notice also that Sea To Summit Aeros is one of the best rated camping pillows online. So in a conclusion, I will say that Sea To Summit Aeros is one of my favorite camping pillows and definitely one of the best in this list. The verdict and the final score for this camping pillow are 8.7. All these things make the Sea To Summit Aeros the best inflatable camping pillow. Nemo Fillo Camping Pillow is another favorite of mine hybrid camping pillow. I really like the comfort and the support of my head. Actually, this is the pillow which I would take directly to my bedroom. It comes really close to my full-size everyday pillow. The thickness is adjustable which makes the Nemo Fillo perfect for many different camping settings and sleeping styles. Another great benefit of using this camping pillow is that it’s super easy to use. It’s very small almost like an inflatable pillow and it takes very little space in your backpack – only 1.4L. Unfortunately, there is a downside of this pillow – the weight. It weighs around 9.0 oz which is quite a lot if you are planning a multi-day trekking or hiking. If you are camping close to your car or you are planning just a one-day hiking Nemo Fillo is really hard to beat. In our calculations, Nemo Fillo gets an average result of 8.0 which is a good result indeed. Teton Sports ComfortLite is an inflatable camping pillow which inflates automatically when you open the easy twist rapid inflation valve. This makes the pillow one of the easiest to use in our list. But this is not the reason why I like it. The best thing about it is the price. It’s the cheapest one on our list with a price of around $18. Teton Sports ComfortLine is also a very well rated product on Amazon. The pillow is comfortable enough for camping, but it’s also a very good option for long flights. The bottom is non-slip, and the top is made of a microfiber top for extra comfort. It comes with a lifetime warranty as most of the Teton products. Unfortunately, despite all these good features, there are some downsides as well. Teton Sports ComfortLite weights around 11.2 oz which is quite a lot if you plan to make big hikes. In general, Teton Sports ComfortLite is a nice camping pillow which you should shortlist when you look for one. Especially if you need for short one night hikes or you want to put it in your RV or car just in case. Teton Sports ComfortLite gets an average result of 7.0 points for the three categories. Klymit Luxe Pillow is another great contender in our list of the best camping pillows for 2018. What I endorse this pillow for is a perfect comfort which gives. The pillow is quite large when unpacked but it gets really small when it is packed. It takes only 0.8L of space in your backpack. The camping pillow is inflatable one but a little bit on the heavy side. The manufacturer claims that the weight is 6.4 oz which is an average weight for camping pillows. If you are a minimalistic hiker maybe you should check for another option. Despite some of the downsides, Klymit Luxe Pillow is a very good camping pillow which is extremely comfortable and very close to the size of the standard bedroom pillow. I personally prefer more the Nemo Fillo and Sea to Summit which in general are better camping pillow. Klymit Luxe Pillow gets an average rating of 7.7 which puts it in the middle of the range. Also, note that it’s on the pricey side of the spectrum with a price of $40. Therm-a-Rest Compressible is a large, relatively lightweight camping pillow. The quality of the materials is really outstanding here compared to the other pillows. The size of the unpacked pillow is really close to the size of a standard pillow. When packed the Therm-a-Rest takes around 2.6 L of space which is really too much for trekking. Another downside of this camping pillow is the weight – 8.6 oz. Some verified purchaser complain that the silky outer fabric is sliding sometimes which causes the entire pillow to slide around when you sleep. But when we talk about comfort this camping pillow is a top pick. Of course, it’s an inflatable pillow but the manufacturer somehow made it one of the most comfortable ones in the market. It’s also very easy to use because of the design – built-in stuff sleeve. Another great thing about Therm-a-Rest camping pillow is that it is filled with recycled mattress foam which makes it eco-friendly. Not to mention the great price of around $25. It gets an average of 7.0 points across the three categories which are quite a good result. Also, I forgot to mention that Therm-a-Rest is the best camping pillow for side-sleepers. 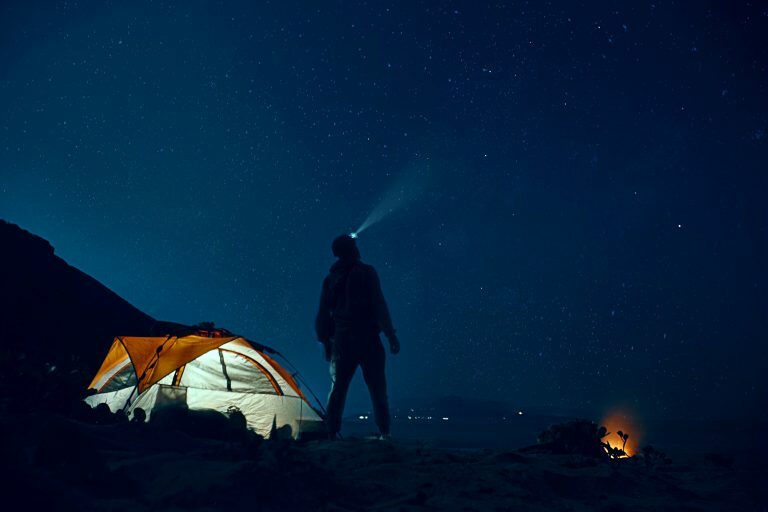 Sleeping outside can be an unforgettable experience if you are well prepared.